^ 1.0 1.1 Η Α.Θ.ΠΑΝΑΓΙΟΤΗΣ Ο ΟΙΚΟΥΜΕΝΙΚΟΣ ΠΑΤΡΙΑΡΧΗΣ κ.κ. ΒΑΡΘΟΛΟΜΑΙΟΣ. The Ecumenical Patriarchate. [2019-01-10]. ^ John Chryssavgis. Ecumenical Patriarch Bartholomew: insights into an Orthodox Christian worldview. International Journal of Environmental Studies. 2007, (64): 9 - 18. 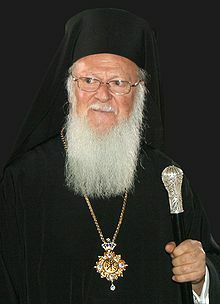 ^ 4.0 4.1 4.2 BARTHOLOMEW, Archbishop of Constantinople-New Rome and Ecumenical Patriarch. [2018-09-26]. ^ 5.0 5.1 Patriarch of Constantinople Pledges to Grant Autocephaly to Ukraine Church Soon. Sputnik. 2018-09-23 [2018-09-25]. ^ 俄罗斯政府. Meeting with Ecumenical Patriarch Bartholomew I of Constantinople and Patriarch Kirill of Moscow and All Russia. 2010-05-25 [2018-09-26]. ^ Orthodox News Joint Declaration of Pope Francis and Ecumenical Patriarch Bartholomew. 2014-11-30 [2018-09-26]. ^ BAYRAM KAYA. One arrested as plot to assasinate Patriarch Bartholomew uncovered. Zaman. 2013-05-10 [2018-09-26]. ^ 君士坦丁堡普世牧首区. Announcement. 2018-12-19 [2018-12-20]. ^ 希腊城市时报. Greek church leaders sue Princeton University over Stolen Manuscripts. [2018-12-20]. ^ Orthodox Church split fuels Russia-Ukraine tension. BBC News. 2018-09-03 [2018-09-26]. ^ Leyla Yesiltas. Erdogan, Andrew Brunson and Ukrainian Church autocephaly. Modern Diplomacy. 2018-09-25 [2018-09-26]. ^ Ecumenical Patriarchate. Announcement (11/10/2018).. 2018-10-11 [2018-10-16]. ^ Poroshenko, Bartholomew sign cooperation agreement (UPDATED). 基辅邮报. 2018-11-04 [2018-11-04]. ^ 君士坦丁堡普世牧首区. Communiqué (15/12/2018). 2018-12-15 [2018-12-20]. ^ Mikhail Palinchak. Schismatic Ukrainian church head to receive autocephaly decree on January 6. 塔斯社. 2018-12-16 [2018-12-20]. ^ PATRIARCH BARTHOLOMEW FORMALLY GRANTS TOMOS OF AUTOCEPHALY TO UKRAINIAN SCHISMATIC CHURCH. Orthodox Christianity. 2019-01-06 [2019-01-08]. ^ “IT IS UNREASONABLE TO STOP A SCHISM AT THE PRICE OF THE UNITY OF THE ORTHODOX WORLD”—PAT. JOHN OF ANTIOCH. Orthodox Christianity. 2019-01-06 [2019-01-08]. ^ CHAUVINISTS, POLITICIANS, UNIATES, AND CONSTANTINOPLE SPREAD SCHISM IN UKRAINE, SAYS SERBIAN CHURCH (+ VIDEO). Orthodox Christianity. 2019-01-03 [2019-01-08]. ^ POLISH CHURCH REJECTS PAT. BARTHOLOMEW’S REQUEST TO RECOGNIZE NEW UKRAINIAN CHURCH. Orthodox Christianity. 2019-01-03 [2019-01-08]. ^ ABP. CHRYSOSTOMOS OF CYPRUS WILL NOT COMMEMORATE HEAD OF UKRAINIAN SCHISMATICS. Orthodox Christianity. 2019-01-09 [2019-01-10]. 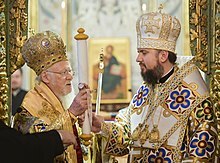 ^ Patriarch of Alexandria pledges support to canonical Ukrainian Church, urges Orthodox unity (VIDEO). RT. 2018-09-29 [2019-01-08].